This is the first of a series on homemade cleaning products. I’ve had a few requests for these recipes, so I thought I’d share them here. I’m not going to call these recipes non-toxic, as obviously anything that kills bacteria and mold is toxic, though the goal is to use substances that are not toxic to people and pets. In addition, homemade cleaners are far, far less expensive. 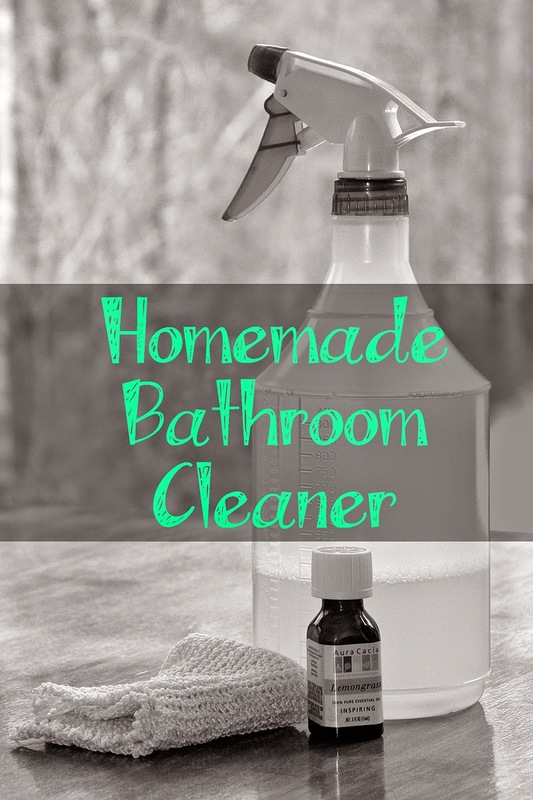 This is my favorite bathroom cleaner recipe, and I've been using it with great success for a few years now. I even use it in the kitchen sometimes too. It smells great, doesn’t bother my asthma, kills bacteria and mold, is the best soap scum remover I’ve ever used, and prevents mold from growing until it is rinsed off. Best of all, it costs me about $1.85 for 20 ounces. Borax is an excellent deodorizer, and loosens stuck on dirt and soap scum. It is important to use a detergent, and not a liquid soap for this recipe. I use 7th Generation Natural Dish Liquid. The grapefruit seed extract is powerfully anti-fungal, and unscented. You can substitute tea tree essential oil if you like. My kids complained about the characteristically pungent smell, so I decided to use the equally effective grapefruit seed extract. The lemongrass essential oil is antimicrobial. A number of antimicrobial essential oils can be substituted here, including but not limited to: thyme (which has been shown in studies to kill MRSA), sweet orange (which can be toxic to cats), rose, clove, eucalyptus, cinnamon, rosemary, orris root, birch, tea tree, and lavender. The following essential oils should NOT be used by or near pregnant women: pennyroyal, sage, wintergreen, basil, myrrh, or thyme. For that reason, I don’t use them in my cleaner recipes. The water needs to be as hot as possible to dissolve the borax. Pour all of the ingredients in a spray bottle and shake to mix. It is important not to reuse a spray bottle from a commercially available cleaner, so as to avoid chemical reactions. If the borax doesn't dissolve all the way, leave it overnight, and shake in the morning. For soap scum, I spray down the surface, and let it sit for a few minutes while I do something else, then wipe it down with a hot wet rag. Easy peasy.